So this is what you mean by democracy? Itâ€™s ridiculous to be so taken up with an election from which I have been disenfranchised, but nevertheless. Last nightâ€™s election count from the UK had me sitting up till midnight, and up again before 6 this morning, to follow on TV and Internet. There is a vicarious satisfaction in seeing Labour cut down to size, in seeing the Tories scrambling, in seeing the Nasties (in the form of the British Nationalists) beaten back, in seeing the Greens take their first parliamentary seat, but itâ€™s not like it means anything to me any more. Iâ€™ve been disenfranchised by the UK twice now. The first time was when I moved abroad in 1982, the second was in 1995 when my grandmother died. Two lesser known bizarrities of the same British electoral system that looks set to give the â€moral rightâ€ to govern to a party that commands around a third of the popular vote and the support (if the 69% electoral turnout the BBC is claiming is true) of only about a quarter of the voting population. It was like this. In 1982 I moved abroad for the first time to work. In the spring of 1983, Mrs Thatcher called an election. A number of my Scandinavian colleagues had recently taken part in elections and voted at their embassies, so I thought I could do the same. Went off to the British Embassy where they smirked at me and told me that by moving abroad I had disqualified myself. â€œWell, what about you lot then,â€ I asked. â€œAre you disqualified because youâ€™re working abroad?â€ Of course they werenâ€™t. Diplomats (if they arenâ€™t members of the aristocracy for whom other rules apply) are still technically working on British soil and so have a vote to cast. Where, Iâ€™m not sure. Westminster, perhaps. So I watched the election from afar and comforted myself with the thought that most people who live and work abroad would probably cast their vote for the Tories anyway. Had ex-pats had the vote, mine for Labour, or Liberal, or Social Democrat would have drowned in the blue sea of Tory votes the others would have cast. Still, I was disappointed. By 1985 Mrs T and her government, scrambling around for all the votes they could get, had changed the law and enfranchised British citizens living abroad. I was living in Finland then, and duly got in touch with the British Embassy in Helsinki, filled out the forms and got my vote all in time for the 1987 election. Unfortunately, there were snags. Because of the antiquated and invidious electoral system Britain espouses, I could only vote in the constituency where I had last been registered as a voter. More, I could not cast a postal vote, but had to give my vote to another voter living in the constituency who would cast it on my behalf. Tough decision. I would have liked to have been able to vote in Leeds or in Birmingham, both cities where Iâ€™d lived as a student and where my vote might have made a difference. Unfortunately, the last place Iâ€™d been registered to vote was in core Conservative territory; West Hove and Portslade. And the only person I knew still living and voting in the constituency was my grandmother. Gran was at a heart a communist, but pragmatically a lifelong Labour voter and she wasnâ€™t having anything to do with tactical voting. The whole business felt rather futile, but I still went through the motions. Gran got my vote, had to take a taxi from her own polling station to the one where she could cast my vote, and Labour’s candidate in Hove got two votes instead of one from us. Labour still came in third that time. The next election was in April 1992, I was living in the north of Sweden, and if I remember rightly I still had my vote, but Gran was not in a state to help or care. Sheâ€™d died in February. At various points the qualification requirements for enfranchisement for Brits abroad have bounced about like rubber balls. You had to have lived and been registered in Britain within the last 5 years, or 20 years, or 15 years. (Itâ€™s 15 years at the moment, and postal votes are allowed now.) I donâ€™t know what the situation was in 1997, but I didnâ€™t have a vote then. Still, I sat up all night and when Labour won West Hove and Portslade, I knew I was seeing an earthquake in British politics. But isn’t that Fredrik Reinfeldt? Considering the obstacles it must be an earthquake that the Greens even got an MP, then. Seriously: I haven’t been aware of all these idiosyncrasies of the British electoral system, but I have understood that it’s not been very reliable. New blog, new system: WordPress. Hopefully much better. The electoral system… Ah! I don’t need to write any MORE about it, do I? With any luck the Lib Dems will force either Labour or Conservative to change it into something that better represents voters’ wishes and any further talk will just be academic. But who knows. Interesting times, anyway. A very long post but well worth reading. 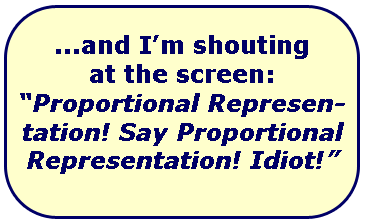 I really could hear your shouting “proportional representation” all the way to France! Hehe! Thanks for your comment, Kristina. Glad you liked the entry. Yesterday was a marathon TV/Internet session from about 6 in the morning till about 6 in the afternoon. I only gave up when the BBC started repeating themselves for want of anything new to report.